The Wheels Through Time Museum is a melting pot for motorcycle enthusiasts from around the world. Great stories are told, memories relived and sometimes deals are made. I made a deal with Jim Bentley to work on a 1946 Harley-Davidson. He told me the fascinating story of his father-in-laws pride and joy, the 46 Knucklehead. His wife Teresa was also excited to tell us the story of the family treasure. The bike was originally blue and she said her dad always regretted painting it red. I believe Teresa shed a tear when the bike was left here for restoration. A simple tune up was in order for Jim and Teresa Bentley’s 1946 Knucklehead. Jim knew all along we would have to completely restore the bike. You see Jim is a deal maker. He owns and operates one of the most reputable Harley-Davidson Dealerships in the land, Man O’ War Harley Davidson in Lexington, Kentucky. The note under the seat to fully restore the Knucklehead was real and the clock was ticking. It was really a matter of pride and professional courtesy that I took on the task. It takes several hundred hours to complete a machine to that standard. Credit is due to all that participated in the restoration. John Dills produced the quality paint job. Tires are made by the Coker Tire Company. My pal Chuck at Kick Start motorcycles is always helpful with hard to find parts. Replicated parts are supplied by the V-Twin Company with many of their high quality fasteners manufactured by the Colony Manufacturing Company in Ohio. Heathers Leathers constructed the leather work, and many thanks to John Gustafson for partial assembly. Shortly after the bike was completed, Teresa sent me a letter which relates her personal connection with her father, his machine and of course Harley-Davidson. She also commented on me “making” her start the bike featured in episode 1 of American Restoration. The following message is a tribute of the restored Harley-Davidson Knucklehead on display at Man O’ War Harley-Davidson- written by Dr. Teresa Bentley: 1946-1946 ½ Knucklehead owned by Elbert Ray Beachum of Union City, Tennessee. Restored by Dale Walksler of “Wheels Through Time Museum” in Maggie Valley, North Carolina. This restored Knucklehead was owned and often ridden by the father of Dr. Teresa Bentley, wife of Jim Bentley of Man O’ War Harley-Davidson. This machine has been a part of the family since purchased in approximately 1951. Ray, a farmer in northwest Tennessee, bought the bike from a “river man”, colloquial term for a bargeman of the nearby Mississippi River. The “river man” needed $500 and offered the motorcycle to Ray on the condition that at his return, the bike would be resold to the original owner. He never returned and the Knucklehead would become a member of the Beachum family for 60 years. Ray often rode the bike when Teresa was a young girl. She can remember riding behind her dad when she was 5 years old or even younger. Family members were enamored of the bike, and all takers tried to conquer the “suicide clutch” and tame the unruly bike. With a spirit and personality all its own, the motorcycle survived the family of 5 kids, the wear and tear of Tennessee cotton, soybean, corn, cattle farm, and life in the rural south. Ray kept the bike in its original condition for many years and did his own servicing and repairs. He ultimately allowed a few changes to be made then parked the motorcycle for years. In 1992-95, the Knucklehead briefly lived with Jim and Teresa in Somerset but wasn’t ridden. Ray then decided, after the death of Teresa’s mother, that he wanted to ride again, and “rescue” the bike. After firing it up, he promptly ran into a brick retaining wall in Somerset. 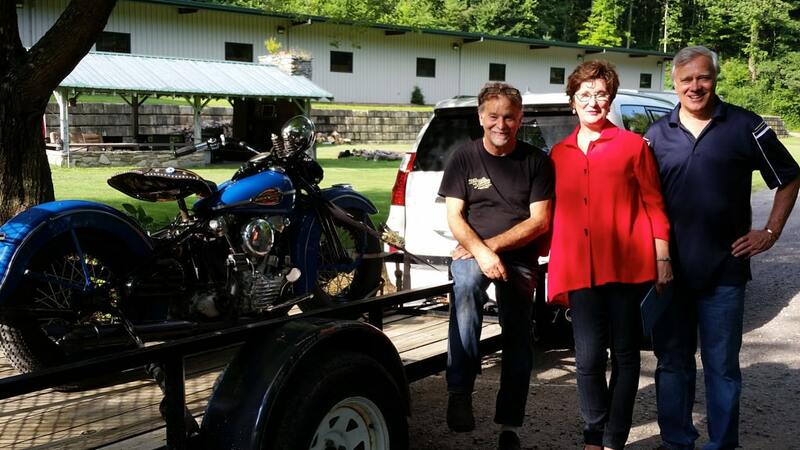 Unharmed and undaunted, he loaded the bike and returned home to northwest Tennessee. After disassembling the bike, painting it bright red, and putting it back together, he began to regularly ride the cantankerous old bike. Ray would take lady friends on rides and occasionally allow the bike to be shown at local events. He rode until he died in 2003 at the age of 75. After Ray’s death, the bike sat abandoned for over 10 years. Only to be “rescued” again, restored and reborn in its original colors and ready to ride, thanks to the generosity of Jim Bentley and the passion and talents of Dale Walksler of Wheels Through Time Museum. Dale fell in love with the story of the bike and has restored it to its full power and glory. We are so proud to be able to present this beloved iconic family treasure to the public thru “Man O’ War Harley-Davidson”. The love, hope, passion and pure gut and tenacity of Harley-Davidson and the legacy of one family are shown here. It is a true reflection of Ray Beachum, his passion, optimism, grit, and to his family, his star power.